Happy Tuesday! It's a heat wave in Kansas and that pretty much means you melt Every. Single. Time. you step outside. I don't mind the heat so much, but I don't like the humidity. Today I am sharing my tank I originally shared from my trip to Laguna Beach last summer; this time I paired it with these gorgeous blue shorts. They remind me of the color of a little blue Tiffanys box. Speaking of little gift boxes, I have been so wrapped up in the planning of my trip to Palm Beach coming up I haven't mentioned I have a birthday coming up too! I will be in Florida this year to celebrate and I think it's the first time I haven't been home on my birthday! I guess that means we will have to have multiple celebrations!! I am actually hoping we will be snorkeling on my birthday. Either way, it will be a day of celebrating with sunshine and cocktails! Styling tip: When pairing two blues together, they don't need to match if there is a complimentary color breaking them up. 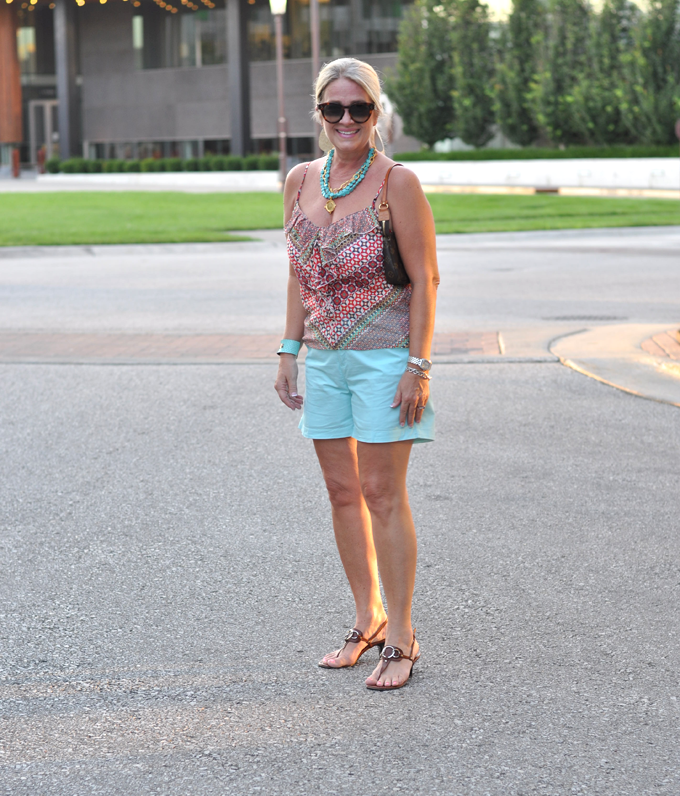 This outfit has a turquoise necklace paired with these light blue shorts. The orange, as a complimentary color in my tank pairs well with both colors and acts a a great divider between the two shades. If you are wanting to experiment with colors you may read my entire post on the color wheel here. I urge you to step out of your comfort zone a bit and have some fun. Orange is not a favorite for me, but I do love the two blues together.